Finally got round to putting my S2 up for sale on Pistonheads. Having looked at the previous MOT certs, I'm using it less and less, mainly due to severe sciatica after I do more than a 15 minute drive. I can drive the Fiat 500 for a full tank, roughly 3 hours with no ill effect, so it's definitely the Porsche, sadly. It's too nice a car to be sitting in the garage doing nothing. Car wash gear out today for a spruce up! For a first run out on track after a major rebuild I'd call it a success in as much as I didn't blow it up, nothing fell off, it didn't do anything widely unpredictable, and between me and the car we managed to stay out of the kitty litter, brakes were good and showed no signs of fading. On the downside, looks like I might have to pull the rear suspension again and reindex the T bars +200 miles on the road apparently is not enough to find its final resting position, 10mins on track and it 'settled' another 25mm and I've no adjustment left on the spring plates now. On the night I just dropped the front another 10mm to take some weight off the rear which was enough to get a few more laps in before the end of the session, but still had some tire rub when loaded up coming out of corners. gets a bit lower with 10 stone of fuel in the back or my brother in the boot, but it measures out to be correct by the Manuel. Refitted the plastic undertray having replaced a number of missing bolts with stainless versions. Replaced missing -(through corrosion) spring screw clips at the bottom of the front bumper so I could refit the batwing. Test fitted the adapter sleeves- (all good) and dropped them and the cut down struts to my friend who is a fantastic welder to do the melting metal joinery stuff. Might get them back by the end of the week so I can get them to the powder coaters on Saturday - fingers crossed eh? 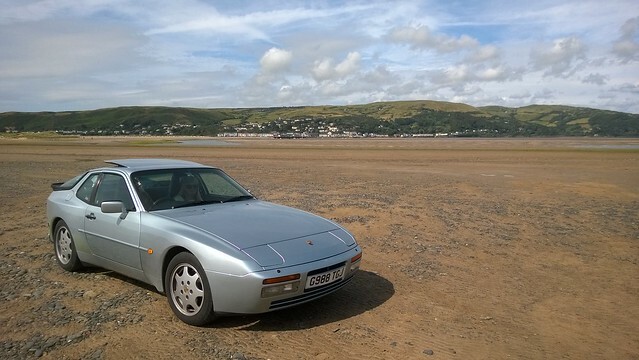 Not exactly what I did today, but, took my car across to North Wales for a few days last week. May not seem much, but up until now I had only used the car for trips of circa 20-40 miles, so a 750 miles round trip including hacking across the country and back on the M180 and M62 was approached with some nagging doubts given the car had been stored for 10 years before I got it last year and you never know if a hose/or seal will let go when it gets good and hot on a long run. Anyhow, apart from me noticing or starting to notice a vibration through the steering wheel when applying the brakes (seeking help/advice on this in a separate post) it all went rather well. Practical (2 + cases/bags, etc) , comfortable (no issues with the seats / driving position) and fun GT type car. Just what I hoped the car would be. I also had several admiring comments from people we met on the way , so a great trip. It's not concourse and is unlikely to ever be perfect, but I do enjoy driving it and want to keep it running well. I'm no mechanic and this is more of a fettle / try and keep it running well story as opposed to major surgery / restoration but so far I have:- fixed fan speed resistors (only running fast), changed the armrest cover hinge, fixed faulty boot micro switch, changed various fluids /gearbox oil, fixed sun roof directional relay, glove box hinge/lid holder, quietened the interior temp sensor fan, had bonnet struts replaced , flexi rear fuel lines replaced, some welding /paint to lower front wings, sills and roof. There's plenty still to do i.e. :- one horn u/s, steering wheel recover, washer bottle replace, h/lamp washer pump fix, radio aerial booster fix, etc. (and the previously mentioned vibration from the brakes), but so far it's been a lot of fun and occasional frustration (as something else snaps, or you find something else wrong as you try and fix something). I had the oldest and least advanced (by far) car out on track, with zero driver aids, yet was able to push harder and closer to the limit than all but a few. A great testament to the fundamental engineering and layout (balance) of these cars. Hi Prophead, the car looks great. Nice photos. Mine is just a humble lux but each time I drive it I’m amazed by how well balanced it is. Thanks guys. Was pish weather as they say here, but still a great event with a great turn out of cars and public. Fitted a linear throttle response cam after seeing a few good posts about them here. 5 min job if that and the car feels far nippier, love it. Finally grew some courage to get the rear end up on axle stands - with that done & my fears of lifting it and it all going horribly wrong put to bed, the wheels came off, the calipers came off ready for refurbing and so did the brake discs. If I can get home early from work one night this week, I might be able to get the rear B6 replacements installed now I know where to undo the top-mount fingers crossed eh? The lower bolts are the only bolts on the car that were copper slipped from the factory. Forgot they were torx! I had nuts welded on to mine to get them out hence the confusion. Probably take me 30 mins to scrape the mud off it’s that bad! Tonights plan is to slide the gear linkage forward and drop the box, Thursday night get the torque tube slid back then bell housing of Friday evening. Hopefully get some extra time on it over the weekend or at least time to clean up the removed parts ready for refitting.